This page presents the different steps to create Aplusix Web exercises using EpsilonWriter. 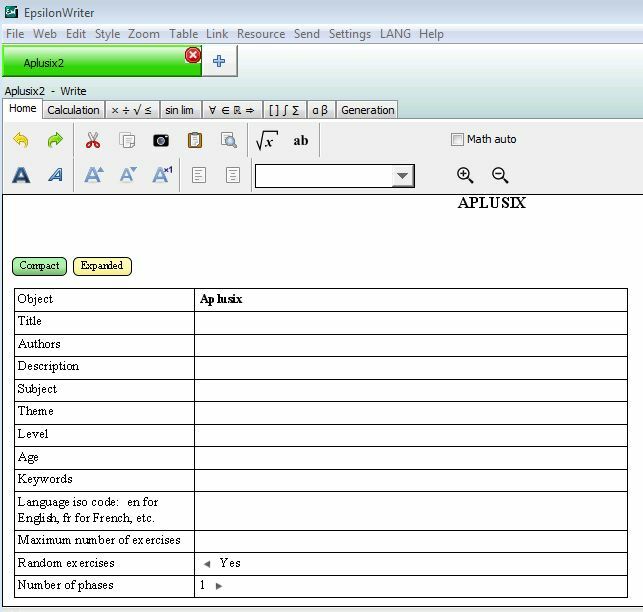 To create your Aplusix exercises, download the free EpsilonWriter editor. Unzip the archive and run the program according to the website guidelines. Once EpsilonWriter opened, select "New" then "Aplusix" in the "File" menu. 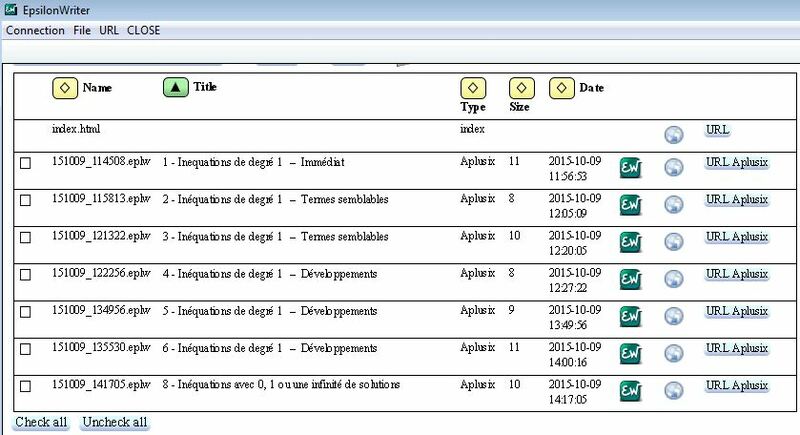 To create Aplusix resources, you will indicate general details about the content and then providr the content itself: different exercises grouped by phases. Generating functions allow creating exercises automatically. The Aplusix resource is build from a table that defines its characteristics and content. General details define the characteristics of the resource that allow its identification and description. Setting the number of phases allows, in particular, to set different kind of exercises in the same resource. An Aplusix resource is divided in phases. Each phase as a unique type of exercises. 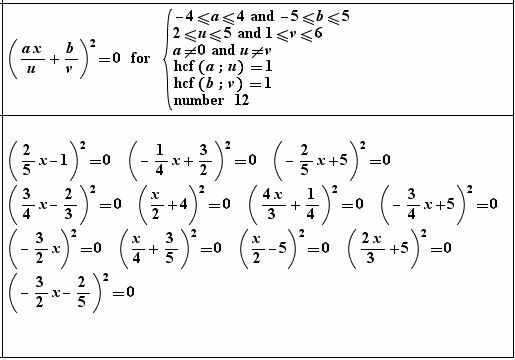 The possible types of exercises are: Calculate, Factor, Expand and simplify, Solve (equation, inequality or system). You can use several phases to combine different types of exercises. You can force the order of the phases or ask to randomly mix the exercises. The initial expression of each exercise has to be added in the definition of the phase. By creating lots of exercises and fixing a small number of exercises for each phase, the student will get differents exercises when reusing the resource. To easily create lots of exercises quickly, EpsilonWriter has some available tools to generate them automatically. You can add some constraints on the parameters or on the generated expression The automatic generation enables the production of lots of execises and thus ease the random renewing of exercises for a given resource. Once registered, you can connect from EpsilonWriter to the epsilon-publi.net server. This server offers a dedicated space to publish your resources. You can save your Aplusix resource in this space with the menu "Web/Web save (Aplusix)". Then you just have to communicate the link to share and disseminate your Aplusix resources.